Oblique exercises and the oblique muscles always seem to play second fiddle to the abdominals in most exercise programs. This is a major oversight for anyone looking to have a fully developed and functionally strong core. Obliques are very important in core strength as well as core stability. Jump Down to the Oblique Exercises Videos or continue reading to learn more. The primary function of the oblique muscles is to rotate your torso. Each side of your trunk at the waist has external and internal oblique muscles. The internal oblique muscle is deep (closer your spine) while the external oblique muscle is superficial (closer to the skin). If you rotate to your left, your left external oblique and your right internal oblique are doing the work and vice versa. The obliques also work with the transverse abdominis to help keep your core tight by increasing intra-abdominal pressure. Intra-abdominal pressure is very important because it helps keep your spine healthy and your waist tight and trim. 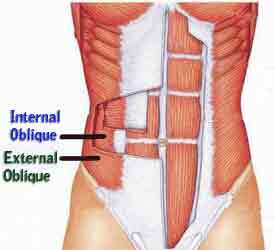 To perform all oblique exercises properly, the core must be drawn in to keep your intra-abdominal pressure up. To draw in, contract the muscles behind your navel in toward the spine. This is different from “sucking it in”, which comes from the diaphragm. 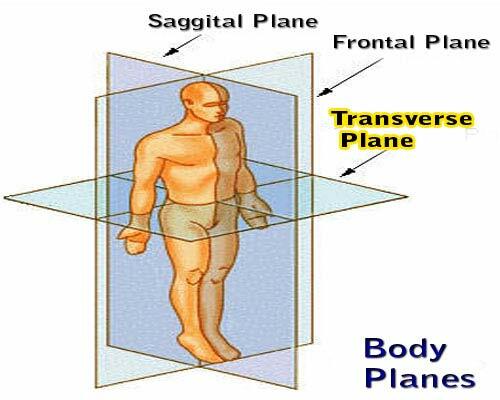 The imaginary transverse plane bisects the body in upper and lower halves. Motion in the transverse plane is rotational, such as when you turn at the waist to the right or left. Since many workout programs completely neglect transverse plane motions many people have little or no muscle control in the transverse plane. This can not only lead to injury but also decrease the performance of transverse plane motions as well as create a unbalanced asymmetrical physique at your waistline. There are many reasons to perform oblique exercises, none more important than to help strengthen and stabilize your core. Every day thousands of people in gyms around the world perform oblique exercises such as side bends in an attempt to reduce their love handles. 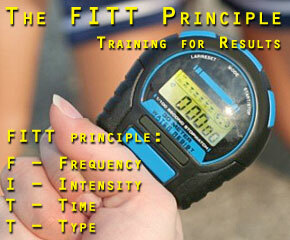 They mistakenly perform these movements because they believe in the fitness myth of spot reduction. Fat and muscle are two separate tissues. Contracting muscles under a layer of subcutaneous fat (fat directly beneath the skin) does nothing to reduce reduce the fat above it. If anything, exercises such as side bends hypertrophy (build) the muscle underneath the fat, which pushes the fat outward, creating an even fatter appearance! If you do not understand about why resistance training exercises do not reduce body fat, please read all about body fat. Who Can Benefit from Performing Oblique Exercises? Can You Guess? Take a Swing at it! Besides the obvious example on the right, you do not have to play sports to benefit from a fitness program which includes oblique exercises. 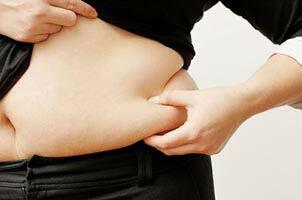 Oblique exercises play an important part in keeping a tight waistline, which is a top goal for many people. With athletes, it should be noted that most sports have a rotational component. Your oblique exercises, including both strength and stabilization exercises, will benefit you greatly because they help strengthen motions in the transverse plane. What is the Best Way to Train the Obliques? Athletes, such as baseball players, should train with explosive movements which mimic activities in their sport (swinging & throwing). If your goal is to stay healthy, tone up, and keep a tight mid-section, you should perform your oblique exercises under control and with strict form. For the following oblique exercises, it is necessary that you are able to isolate the motion which your obliques create and avoid hip motion. Any motion at the hips means you are using your legs to create momentum and turn your waist. When you first begin oblique exercises, keep your hips steady and turn your waist only. As you become more advanced, you can perform these exercises as functional exercises, getting your whole body involved, but only after you have mastered the form and have good neuromuscular control of your oblique muscles. Proper form is essential for oblique exercises to be most effective. Integrating your core stabilization with your rotational motion is essential to get the most out of your oblique muscle exercises. Medicine ball wood chops are a very basic obliques and core exercise. You have to perform them with proper attention to form in order to get any benefit. You must actually feel your oblique and core muscles working to get benefits from this exercise. Review the anatomy section above if you need help determining where your obliques are located. Start: Stand up tall with your feet shoulder width apart. Make the movement more difficult by moving your feet closer together. Grasp a medicine ball with your hands and hold it above one of your shoulders. Begin the motion: Rotating through your obliques, bring the ball downward in a slow chopping motion toward the opposite hip. Modifications: If you do not have a medicine ball handy, you can use any form of weight, such as a dumbbell, weight plate, can of soup, or even just perform them with the weight of your own arms. To increase the difficulty of the exercise you can move your feet closer together, stand on one foot, or stand on any controlled unstable object, such as a balance disc or BOSU ball. Once you have mastered drawing in your core and isolating your obliques with movement at your waist, you can add additional resistance. Start: Stand to the side of a high cable setup with a rope attached. Hold the rope so your little fingers are both facing towards the floor. Step away from the machine so the weight stack will not clank when you perform reps. Begin the motion: Keep your core tight as you pull the cable across your body. It should pass in front of your belly button as you turn your torso and finish with the rope at your thighs. Modifications: Besides increasing the resistance level, you can increase the difficulty of these cable-rope wood chops by standing with your feet closer together. Standing on an unstable surface such as a balance disc or BOSU ball will also progress the difficulty of most core exercises, including this one. The Russian twist is an excellent exercise which you can perform slow & controlled or explosively. Start: Form the stability ball supine bridge position. It is best to have your feet shoulder width apart. Put both your hands straight up towards the ceiling. Your hands should be together in the middle of your chest. This is where they should remain during the entire range of motion. Begin the motion: Put your hands up towards the ceiling. Keeping your hands interlocked directly above your chest, turn to each direction, making sure to keep the your feet flat on the floor. Be sure to keep the 90 degree angle in your legs and your arms extended in the middle of your chest for the duration o the exercise. If your feet move at all, you did not perform the stability ball exercise correctly. Start over and focus on total-body stabilization. Modifications: You can increase the difficulty of the Russian twist by holding a form of resistance in your hands such as a dumbbell, weight plate, or medicine ball. The harder the stability ball, the more difficult the exercise will be. The cable push-pull incorporates upper body opposing actions, including the obliques, making it an advanced obliques exercise. Start: Stand in the center of 2 cables. Grab the cable closest to the machine with your arm which will be pushing. The opposite (pulling) arm should hold the cable on the other side of your body. Spread your feet farther than shoulder width apart and point both of your feet straight ahead. Begin the motion: Keeping your core drawn in, push the handle closest to the machine away from your body as you pull the opposite cable back, bringing your elbow backward while you twist your body in the direction of your pushing arm. Perform a given number of reps going in one direction. As you complete the last rep, hold both cables in place, pivot your feet, and turn the other direction. Hey! What about Weighted Side Bends? Some people believe side bends are effective oblique exercises, but in the opinion of this personal trainer, they are complete crap and have no place in anyone’s exercise routine. Some people even perform this terrible exercise with a weight in each hand, which is completely pointless as the weights cancel each other out. Top three reasons Weighted Side Bends aren’t good oblique exercises: the motion is completely unnatural, it can result in a wider waist, and it can cause or exacerbate back pain and injuries. Exercise the obliques at home with these five key exercises. This post was created with a special emphasis on women, however, men can also utilize these supper effective exercises for outstanding results. Find many oblique muscle exercises including exterior oblique cable exercises in our exercise video library. Also find exercises for the entire body. Building and toning the abdominal area requires more than just simple crunches and exercises for the obliques. Oblique exercises go a long way toward building those abs that you see in magazines, as long as you perform a variety of other core exercises. Learn the anatomy and function of the deep core muscles that stabilize your spine, keeping your lower back healthy and your stomach area tight. Learn three key core stabilization exercises, why core stabilization is more important than core strength, problems caused by an unstable core, how core stabilization provides relief for low back pain, and more.